Early on the morning of May 23, 1934--80 years ago today--a stolen Cordoba gray, four-door Ford V-8 left the town of Gibsland, in northern Louisiana, and headed south. The car’s two passengers--both well-publicized outlaws, the man having recently turned 25 years old, the woman only 23--were speeding to a rendezvous with a criminal accomplice. They were already late. But on a rural road in Bienville Parish, off Highway 154, they spotted their gang member’s father, his old truck apparently disabled on the side of the rutted dirt lane. They stopped to lend assistance. And that’s the moment when all hell broke loose. One of six lawmen who’d been waiting at that point on the road to ambush the car suddenly leaped to his feet and began firing his rifle into the sedan. He wasn’t supposed to have done that. As the story goes, the man in charge of the posse, a former Texas Ranger named Frank Hamer, was going to call out for the couple in the car to surrender. Once the firing commenced, though, there was no turning back. One of the first bullets killed the driver, passing through the Ford’s windshield and carving a vicious path through the young wheelman’s head. He died instantly, and as he did so, his foot slipped off the clutch, letting the Ford roll forward toward a ditch at the side of the road. The slender, petite woman in the passenger seat screamed, “a high shrill wail that haunted the men about to kill her for the rest of their lives.” Although there was talk later on that those two outlaws had fired at the posse, and they’d fired back in self-defense, the fact was that the several guns the couple had packed along with them were laid out on the Ford’s backseat, because there wasn’t enough room in front to keep them handy. In short order, 150 or more bullets were blasted at the car, some ricocheting off, others getting trapped in the Ford’s metal body, but enough whizzing through the doors and windows to murder both occupants several times over. Hamer himself fired a barrage of bullets through the passenger-side window, making sure that the young strawberry blonde--already slumped down in her seat, covered with blood--wouldn’t be leaving the scene alive. That cacophonous ambuscade lasted only about 16 seconds, but it concluded Hamer’s 102-day pursuit of the outlaw pair--and put a violent stop to the notorious two-year criminal careers of Clyde Barrow and Bonnie Parker. Those misguided lovers from the wrong side of the tracks in Dallas, Texas, weren’t the brightest, most crafty crooks roaming Depression-era America; in fact, they could fairly be called ardent bumblers. They remained at large and alive as long as they did, mostly because communications were pretty poor in the 1930s, and law-enforcement agencies didn’t do well at sharing information. Yet in that era when the news media and FBI were hot on the trails of more skilled malfactors, such as John Dillinger, Baby Face Nelson, and Pretty Boy Floyd, Barrow and Parker received a lot more publicity for their hold-ups of banks, gas stations, and country stores (as well as for crimes they didn’t commit) than they might have had they been operating in isolation. 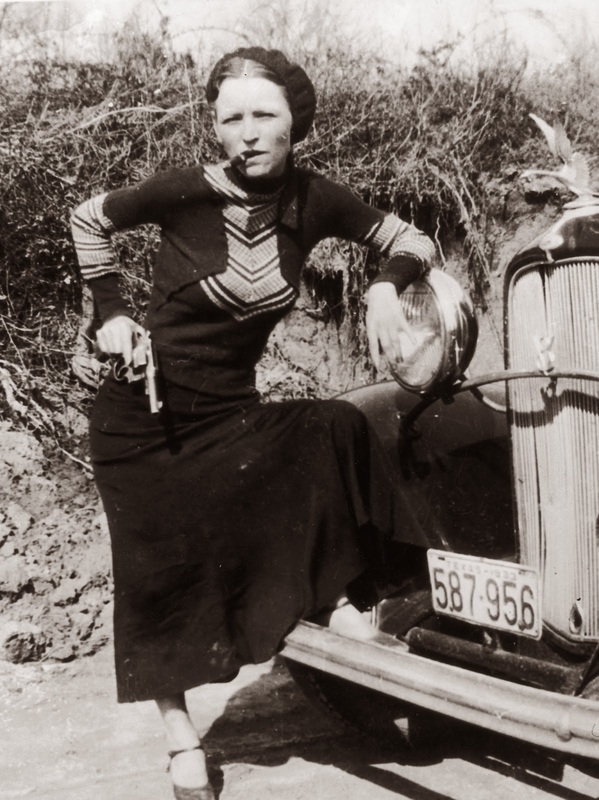 (Left) Bonnie Parker in full “moll” mode. Thanks to newsreels at movie theaters and photos transmitted to newspapers through the recent magic of wire services, most Americans believed they knew exactly what Clyde Barrow and Bonnie Parker looked like. The young couple loved to strike dramatic poses for the cameras that they carried along with their guns, and some of these pictures had fallen into the hands of lawmen who made them available to the media. So the nation became familiar with nattily dressed Clyde brandishing a menacing Browning Automatic Rifle, and with Bonnie assuming unladylike postures on the bumpers of stolen cars. The most famous photo showed Bonnie with a cigar dangling from the corner of her mouth, a particularly eye-catching image in a time when most respectable women would discreetly puff cigarettes in private. Thanks to the media, Clyde and Bonnie had quickly come to be considered the epitome of scandalous glamour. But in person Clyde was short and scrawny, and Bonnie’s looks were ordinary. They were both crippled, Clyde from cutting off two of his own toes in prison and Bonnie as the result of a car wreck nine months earlier in which her right leg was burned so badly that bone was visible in several places. She hopped now rather than walked. Clyde often had to carry her. They had little in common with the glittering images of themselves that mesmerized the public. Today, the town of Gibsland (pop. 979) will hold its annual Bonnie and Clyde festival, complete with live entertainment, a jambalaya feed, and a lookalike competition to find matches for Bonnie, Clyde, and the posse members who assassinated them. Meanwhile, there’s likely to be more attention than usual around the so-called Bonnie and Clyde Death Car, the Ford V-8 in which that pair met their end, and which is currently on display at Whiskey Pete’s Hotel & Casino in Primm, Nevada--bullet holes and all. 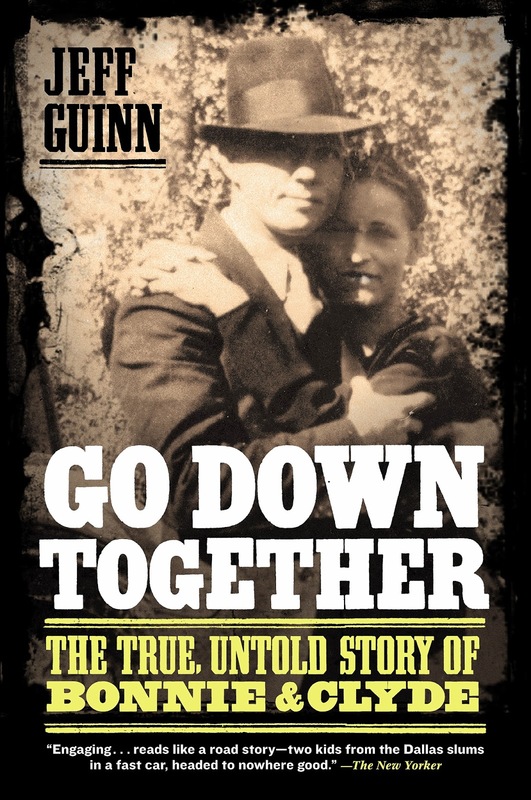 If you aren’t planning to be in either of those towns this afternoon, at least you can check out the video below, a simplistic but not overly sensationalized account of Clyde Barrow and Bonnie Parker’s two-year criminal run, originally presented in 2009 as part of Britain’s Timewatch documentary series. READ MORE: “Legacy of Dallas-based Bank Robbers Bonnie and Clyde Lives On,” by Tristan Hallman (The Dallas Morning News); “Bonnie and Clyde Gunned Down 80 Years Ago Today,” by Adam Duvernay (Shreveport Times); “Bonnie & Clyde Met Violent Death 80 Years Ago,” by Paul Prost (The Saratogian); “Bonnie and Clyde--13 Things You May Not Know About America’s Most Infamous Outlaw Couple” (Vintage Everyday); “10 Things You May Not Know About Bonnie and Clyde,” by Christopher Klein (History.com). What astounds me is that those who participated in the ambush weren't convicted of murder, and that only the later film (thought briefly) touches on the fact there was no probable rationale for killing the suspects rather than arresting them and going through a trial.